Esta obra fue realizada a partir de una preocupación –personal, artística, política, humana- por la constante agresión (sutil y/o violenta) que sufren las mujeres desde tiempos babilónicos. El trabajo se acometió desde dos territorios: El íntimo, las heridas de mi propio cuerpo, y el público: los cientos de mujeres asesinadas, especialmente en la ciudad fronteriza de Ciudad Juárez, Chihuahua. Utilizando los medios al alcance, fotografía, escritura, audio y video, registro la búsqueda interna de las energías confrontadas y la conciencia del lugar que ocupo entre las mujeres agredidas del mundo. Mi identidad de mujer, de mexicana, de “otra”. Y la fuerza muy otra del Ya basta! Y saco los trapitos al sol: Tantas jóvenes mujeres secuestradas, asesinadas, aventadas al desierto de Chihuahua desde hace 10 años. Tantas mujeres violentamente muertas en tantas partes del mundo. Nunca podrán ser olvidadas, los crímenes nunca podrán perdonarse. Sus madres claman por una justicia que no llega. Su dolor, sus voces, su llanto nos alcanzan a todas. El silencio también es un crimen. El sitio para la instalación y acción ritual fue seleccionado porque es la representación más cercana a lo que queremos: Justicia, cárcel a los asesinos. Gewalt gegen Frauen betrifft Elizabeth Ross persönlich, künstlerisch, politisch und menschlich. Ihre Annäherung stellt Intimität, ihre eigene Verletzlichkeit und ihre eigenen Verletzungen, der Öffentlichkeit, den hunderten ermordeten Frauen in der mexikanischen Stadt Ciudad Juárez gegenüber. In der nordmexikanischen Grenzstadt Ciudad Juárez wurden in den letzten 9 Jahren mehr als 300 Frauen auf brutale Weise ermordet. Weitere 500 gelten als vermisst. Die meisten von ihnen waren Migrantinnen, 15 bis 25 Jahre alt, arbeiteten in Maquiladoras, Weltmarktfabriken mit niedrigen Löhnen oder lebten von Prostitution. Erklärungsversuche warum diese Frauen umgebracht werden gibt es viele, jedoch keine ernsthaften Ermittlungen. In einer intimen Herangehensweise verbindet Elizabeth Ross das Thema Gewalt mit ihrem eigenen verletzten Körper. Rot als Farbe des Blutes, des Zorns. Elizabeth Ross schafft Aufzeichnungen einer Recherche des inneren Ringens, im Bewusstsein ihres Platzes in der Reihe der vergewaltigten Frauen. this project involves a concern – personal, artistic, political, human- about the constant aggression (subtle and/or violent) suffered by women since Babylonian times. The approach was made from two territories: the intimate: the wounds on my own body , my history, my stories, and the public: the hundreds of murdered women, specially in the Mexican border city of Ciudad Juárez . The intimate approach to the subject of violence relates to my own body: intervened with, wounded, hurt. Photography, writing, sound and video clips were the media available. They record this inner research of the energies struggling inside and the awareness of my own place among the abused women of the world. I have taken out the private to the public, with the colourful fabrics –resembling their dresses- hanging from the windows. It is something that must be talked about, that be solved. It can’t be just a “private” issue anymore. So many young women kidnapped, murdered, thrown into the hot desert of Chihuahua during the last ten years and until now. So many violently killed women everywhere. Their mothers claim for justice and it hasn’t come. Their pain, their voices, their tears reach us all. Silence is also a crime: they can never be forgotten, the crimes never forgiven. The spot for the ritual action and installation was selected because is the nearest to the representation of what we ask for: Justice, Jail for the murderers. 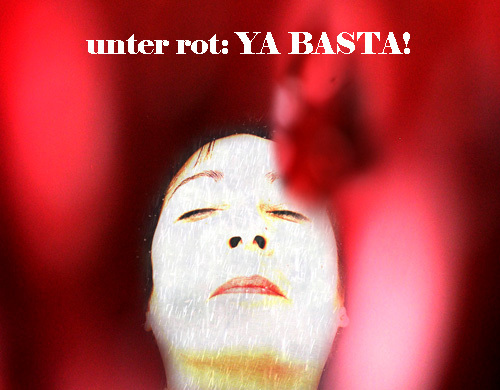 unter rot : YA BASTA!